Combine two European weaves and multiple ring sizes to create a dense cuff. The result is a truly stunning piece (which untrained eyes have even mistaken for dragonscale). The cuff is slinky and supple and just begs to be touched and fidget-ed with while you wear it! Main image uses aluminum rings. 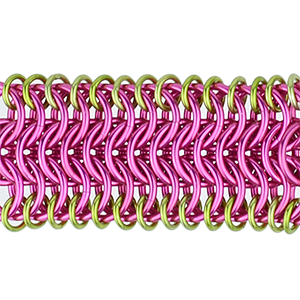 Proficiency in at least 5 chainmaille weaves, including European 4-in-1 (Mesh).